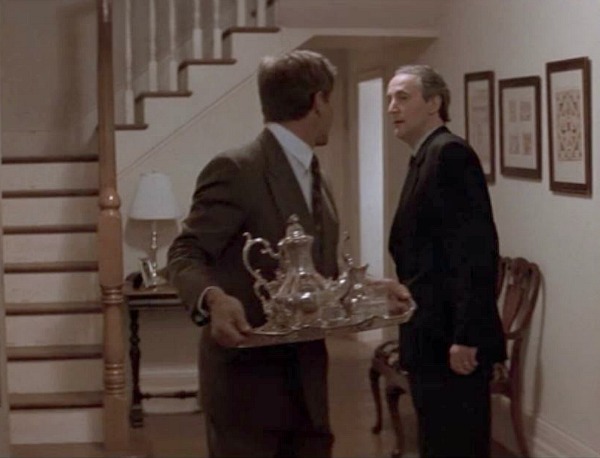 Harrison Ford starred in the 1992 movie Patriot Games as former CIA Analyst Jack Ryan, who witnesses (and foils) an attempt to assassinate members of the Royal Family in England. More interesting (to me, anyway) was his traditional two-story house back in Maryland with the big front porch overlooking Chesapeake Bay. I’ve had a lot of requests from readers over the years to feature this house. When I finally got around to researching it, I realized there’s really very little about it on the Internet. No photos, for sure. So I took these screenshots while watching the movie. The Palos Verdes Peninsula is a gold mine of moviedom. Take the former site of Marineland, near Hawthorne Boulevard and Palos Verdes Drive South. 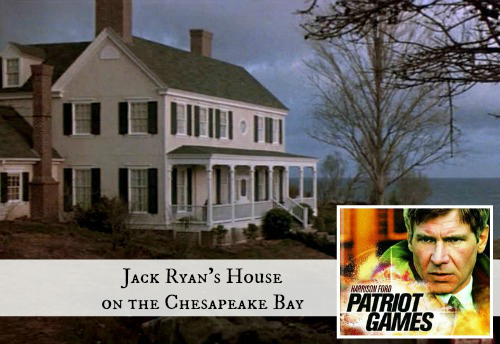 That’s where Harrison Ford’s character Jack Ryan lived in “Patriot Games.” (It was made to look like Maryland). The interiors were created on a soundstage, Stage 18 at Paramount Pictures (via EW). The decorating was very traditional, and very late-1990s. We saw a lot of window treatments that looked like these back then, didn’t we? 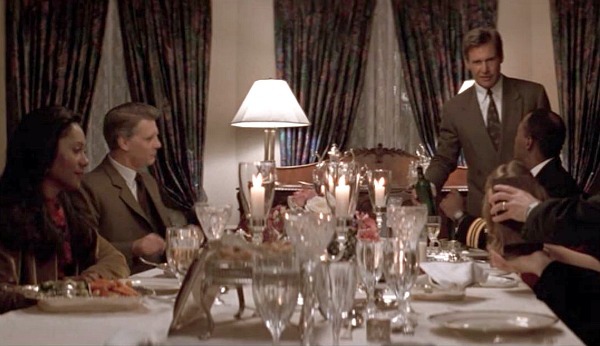 Harrison Ford replaced Alec Baldwin in the role, who played Jack Ryan in The Hunt for Red October. Anne Archer was cast as his wife Cathy. The original ending featured an underwater fight between Harrison Ford and Sean Bean. It didn’t test well with audiences, however, and was re-shot at the last minute. Bestselling author Tom Clancy, who wrote the novel, died last October at the age of 66. Apparently Clancy’s own home was near this one. In an article in 2002, the New York Observer said he spends most of the year at Peregrine Cliff, his 24-room stone mansion on 416 acres overlooking Maryland’s Chesapeake Bay in Calvert County. It has a shooting range in the basement and a World War II–era Sherman tank on the lawn. All I could find online was the aerial view. 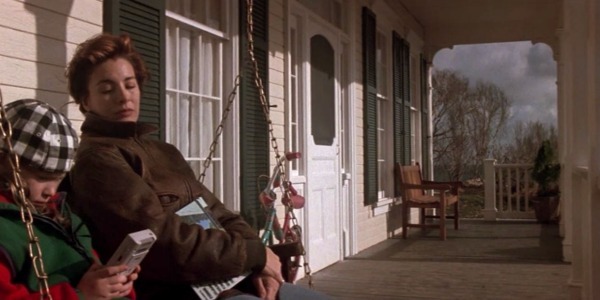 We really didn’t see much of the interiors in general, which leads me to believe that most of the interest in the house from readers was based on the exterior shots in the movie. I read one review from when the movie came out that complained that the lens was “perpetually murky.” It did always look like a storm was brewing. Was the house one of the highlights of the movie for you, too? 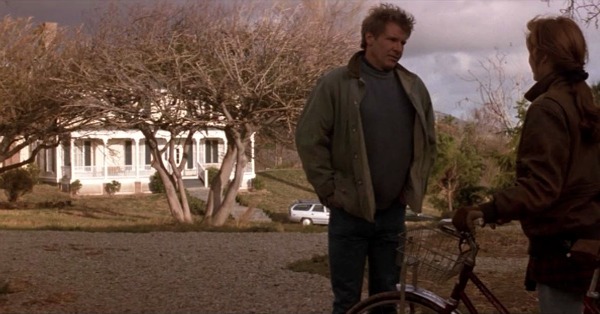 Firewall is another Ford movie that took place inside a waterfront home. You can see pics of it here. 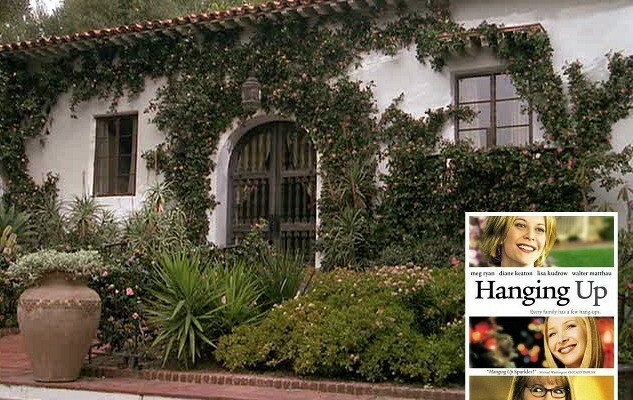 In real life, Harrison Ford shares a home with Calista Flockhart in Brentwood that you can see here. Laura Palmer's Dutch Colonial from "Twin Peaks"
The Victorian on "Witches of East End"
Beautiful house. The interior sets are a little dated, but overall it looks fab. And being a Chesapeake Bay(side) resident myself, I love the location! I remember loving the house in this movie. Now that you mention it, maybe it was the location and that porch if they didn’t show much of the interior. I love your site, I get lost in it for hours. I always loved the house. But it is a lonely setting. It looks like it is the last house down a lonely dirt road perched on a cliff- the only thing missing is the Widow’s walk. Yes, Harrison Ford is a great actor. I appreciate him in every movie. That’s a good way to describe it, Claudia. It does look “lonely.” Which I guess is what made it so perfect for this movie, since you definitely got the feeling that they were pretty isolated out there. When I was little, my aunt took my family to see Annapolis, and on the way there (or on the way back–I can’t remember), we drove past this house. She pointed it out, saying that it was the house from the movie. I wish I could remember more! But I do remember that the house, and its location, were absolutely lovely. Really?! Wow! That is so cool, Corrie. The sets for the interior are very homey, with clutter and ugly appliances and things people use every day. 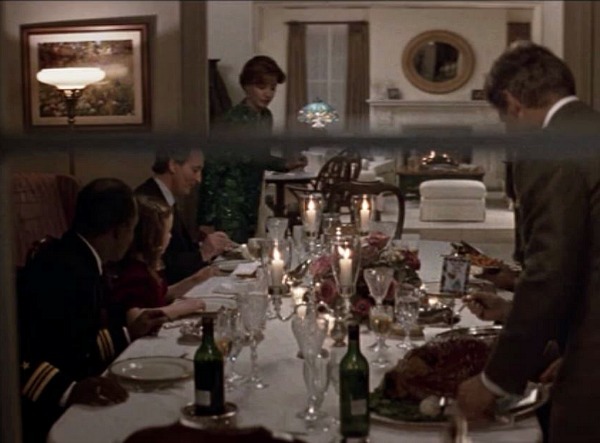 This I noticed when we ended up watching Turner&Hooch last night, the insides of the houses had normal people furniture, it wasn’t like a showroom. Not even sure if they were truly ‘decorated’? TV shows and movies nowadays are so uber-decorated, it looks like the people live in a magazine!! 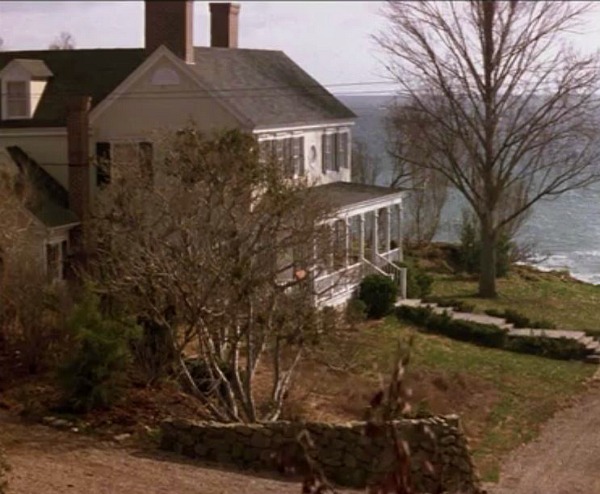 I researched this house a while back, it’s one of my most favorite movie homes. Unfortunately what I turned up, it was a set at the old Marineland aquatic park in Rancho Palos Verdes, California. There was one shot in the movie where you can see some cliffs in the background and I matched it with an old photo of the park where you can see the same cliff outline. The shot is around the 37 minute mark when Jack is talking to his wife while she wheels out a bicycle, in the right background you can see the cliffs/hills. Look up Marineland, Racho Palos Verdes and in some of the park shots you can see the same outline of the cliffs in the background. The photo on my Google image search was Terranea-092310-res that was the best view of the hill/cliff outline. They also mention filming the movie “Life as a House” there, which is another one I get asked a lot about. Thanks, Kelly! I am guilty of coming to this site today to see Robin Williams house again. Such sad news today, and I couldn’t leave a comment on the page that showed his home because it had been closed. I can’t stop thinking about him tonight. It’s so sad, isn’t it? I was shocked when I heard about it. Love the movie and that house!! I get all Gothic Novely when I see cliffs like that. I also love the houses in the remake of Sabrina. That cottage in the Vineyard and their spread in Long Island was too fabulous! Wouldn’t it, though? Sounds good to me! Watching a program on PBS called Distinctive homes of the Chesapeake. Just breathtaking properties. Ooh, I need to look for that! Julia, See if you can link to this. Program was on UNC-TV in North Carolina. Sorry, but I haven’t featured that one. 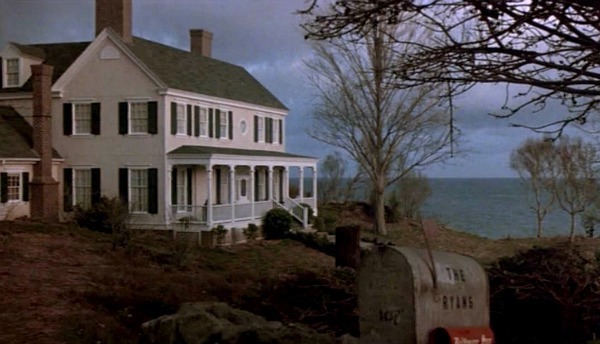 I don’t think I ever saw the movie all the way through, but now and then I’ve seen parts of it on TV and the house is pretty amazing! I always thought this house and the What About Bob house looked to be the same. Love them both! I love the “What About Bob” house, too. How fabulous would it be to have a vacation home on a lake like that?? Gorgeous exterior on this one. I’d love to see this home when it’s summer and the sun is shining. Me, too, Alie. They kind of made everything look bleak to match the mood of the movie, I think. Thanks Julia I was waiting for thispost for years, since your Movie Mondays, I love this house the interiors and the exteriors.When you can see the house in the movie The Possesion, the film is really an horror movie, but some places like the kitchen are incredibly. You have to forget the subject in the story is like The excorsist. Greetings and thanks for share. I recall this home and I thought it was lovely, both the setting and interior. I didn’t mind at all that it appeared to be somewhat isolated as I always used to have a dream of living that way too. To me it doesn’t feel so dated, but then I don’t really bother so much with trends. I’d describe it as homey, warm and traditional which actually I feel more drawn too. Now that you mention it–I think I also thought about the movie What Lies Beneath too. I liked the house so much that I recall conducting my own research. I thought that I’d read that it was located along the coast closer to San Diego area. Regardless I still loved the house and am pleased that you’ve featured it. That movie has been on TV countless times too and sometimes I’ll find myself sitting down to watch a few scenes or two. Thanks for featuring it.